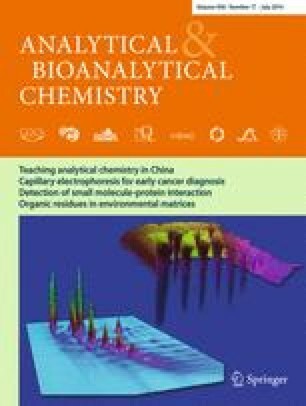 The present work describes the development and validation of a highly sensitive analytical method for the simultaneous determination of 68 compounds, including illicit drugs (opiates, opioids, cocaine compounds, amphetamines, and hallucinogens), psychiatric drugs (benzodiazepines, barbiturates, anesthetics, antiepileptics, antipsychotics, antidepressants, and sympathomimetics), and selected human metabolites in influent and effluent wastewater (IWW and EWW) by liquid chromatography coupled to tandem mass spectrometry (LC–MS/MS). The method involves a pre-concentration and cleanup step, carried out by solid-phase extraction (SPE) using the adsorbent Strata-XC, followed by the instrumental analysis performed by LC–MS/MS, using a Kinetex pentafluorophenyl (PFP) reversed-phase fused-core column and electrospray ionization (ESI) in both positive and negative modes. A systematic optimization of mobile phases was performed to cope with the wide range of physicochemical properties of the analytes. The PFP column was also compared with two reversed-phase columns: fused-core C18 and XB-C18 (with a cross-butyl C18 ligand). SPE optimization and critical aspects associated with the trace level determination of the target compounds (e.g., matrix effects) have been also considered and discussed. Fragmentation patterns for all the classes were proposed. The validated method provides absolute recoveries between 75 and 120 % for most compounds in IWW and EWW. Low method limits of detection were achieved (between 0.04 and 10.0 ng/L for 87 % of the compounds), allowing a reliable and accurate quantification of the analytes at trace level. The method was successfully applied to the analysis of these compounds in five wastewater treatment plants in Santorini, a touristic island of the Aegean Sea, Greece. Thirty-two out of 68 compounds were detected in all IWW samples in the range between 0.6 ng/L (for nordiazepam) and 6,822 ng/L (for carbamazepine) and 22 out of 68 in all EWW samples, with values between 0.4 ng/L (for 9-OH risperidone) and 2,200 ng/L (for carbamazepine). The novel methodology described herein maximizes the information on the environmental analysis of these substances and also provides a first profile of 68 drugs in a Greek touristic area. The online version of this article (doi: 10.1007/s00216-014-7819-3) contains supplementary material, which is available to authorized users. This project was implemented under the Operational Program “Education and Lifelong Learning” and funded by the European Union (European Social Fund) and National Resources–ARISTEIA 624.